Very much Hammond based music, with a big slab of Mellotrons, harpsichord and Moog synths. The bass guitar takes on the role of the electric guitar. Add to that a singing drummer and you´ve got Italian Standarte. Not so much a symphonic prog band as a true retro band. Incredibly "authentic" early 70´s sound that could fool anybody who didn´t know they were a 90´s band. And it´s not just the sound, it´s the way they play that all contributes to the genuine retro feel of the records. All records consists of basically the same kind of music: hard rock, a little psychedelia, with a hint of kitschy rock opera/art rock approach to the songs. Long songs with many parts and subtitles, and on the first album you´ve even got spoken narration to link it all together. The lyrics leave a little to be desired; a lot of repetition and crummy english, but in a way you forgive them ´cause they´re so damn cool. Really groovy riffs and distorted organ solos, plus suprisingly catchy melodies. Guithard, many thanks for interesting & really worthy comment. Material above taken from review in Gibraltar Enciclopedia of Progressive Rock. 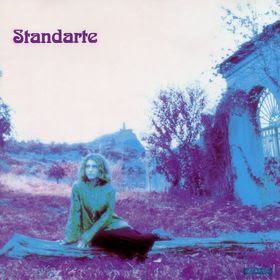 i was in Standarte many years ago and i was the second guitarist they had. i played (but not recorded) all this tracks and other from the second album Curses and Invocations. sorry but you are wrong, there was a competent guitarist in the first album (there are clearly a lot of parts played with a les paul custom and a marshall and not by bass, in facts many parts are guitar driven) and another one in Stimmung (i think) that i replace for a second time. only in some periods of their life (when you saw them) they were without guitar and in the last period they had also the keyboard player from London Underground as a replace for guitar. that's just for being clear.